Shaft | Products Lineup | Products | NIPPON BEARING CO., LTD. The NB shaft can be used in a wide range of applications as a mechanical component from straight shaft to spindle shaft. NB's expertise in machining and heat-treatment turns into manufacturing spindle shaft, roll shaft, and general machinery shaft for rotational motion. NB's high accuracy technology answers various shaft machining requirements. NB performs a wide variety of highly accurate machining processes to provide custom shafting from relatively simple machining, such as tapping and shaft stepping, to the more demanding highspeed rotating shafts and spindles. NB can also answer the special grinding and bore machining requirements. Based on the customer drawings and specifications NB will answer the customer requirements in material (SCM, SKS etc. ), heat-treatment, surface treatment, etc. Most commonly used materials are high-carbon chromium bearing steel (SUJ2) and martensite stainless steel (SUS440C or equivalent). NB's advanced heat-treatment technology gives these materials an excellent wear resistance by quenching and tempering to achieve a uniform hardened layer in the circumferential and axial directions. The cross-sectional picture below shows the hardened layer-depth of the NB shaft. These components ease the shaft installation and help save the design/assembling time. This series is a set of NB slide bush and NB shaft. By precise shaft-grinding, FIT series achieves the best-fit clearance adjustment for a smooth, high accuracy linear motion. 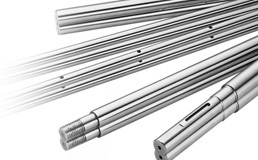 NB shaft is a high-precision shaft that can be used with slide bush or any other bearings. A wide range of machining is provided for customer drawings and requirements. 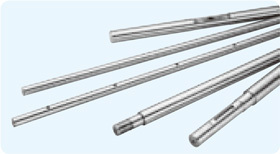 Center-lined tapped shafts are standardized series for easy selection that can be used with the SA shaft support rails. 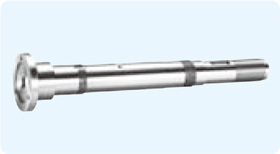 The SNW and SNWS types are inch dimensional shafts with the same specifications as SN/SNS type. 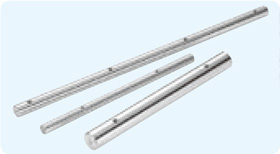 SNW-PD and SNWS-PD types are standardized series that can be used with the WA shaft support rails. Based on drawings and specifications NB manufactures spindle shafts, roll shafts that are for the rotary motion. Material, heat-treatment (hardening/tempering), surface treatment, etc. NB meets customer requirements. Please contact NB for details.